OVET B.V. offers a wide range of stevedoring services in the Netherlands. It can handle commodities including: coal, coke, pet coke, ores, minerals and scrap. The main activities of OVET are lightening, discharging, storing and distribution and screening of solid fuels, ores, other bulk cargoes and scrap. Vlissingen (Capesize) with a capacity of 315,000m2 — 2,000,000 tonnes. Using four floating cranes (3 × 25 tonnes and 1 × 36 tonnes lifting capacity) with a total capacity of 80,000 tonnes per day, OVET also has the flexibility to operate at anchorages both in Terneuzen and in Vlissingen. The draught in Terneuzen is set to 12.50 metres freshwater, making the terminal suitable for Panamax vessels. In Vlissingen, the draught is 16.50 metres saltwater. Vlissingen has two Capesize berthing facilities plus one Panamax berth. Terneuzen and Flushing offer excellent connections (inland waterways, rail and road) to Benelux, France and Germany and have also ideal possibilities for overseas dispatch to Scandinavia, UK and Ireland. The terminal in Vlissingen has a mobile ‘Multidocker’ quay crane which can handle sea vessels, coasters and barges. Capesize vessels. At the Vlissingen terminal OVET operates a warehouse of 6,000m2 for the covered storage of all kinds of dry bulk products. The warehouse contains six separate cells and each cell measures 7,500m3 and can be fully ventilated. OVET Holding holds 50% of the shares of OBA, the bulk stevedore of Amsterdam, which means more service and flexibility for both the customers of OVET and OBA. Affiliated to OVET is the Shipping Agency OVET Shipping, which offers a reliable 24-hour service throughout the River Scheldt area. This guarantees an efficient and effective handling of customers’ vessels. Another affiliate of OVET is OVET Screening, a company which is specialized in screening, crushing and blending activities. At both terminals OVET operates (mobile) screening and crushing installations. Recently investments were done in two new mobile screening installations for the Vlissingen terminal. With these machines OVET is able to screen dry bulk material up to 5 fractions with a maximum input capacity of 400 metric tonnes per hour. Because of its flexible layout and mobile equipment OVET is capable to make 100% homogeneous blends. By means of mobile stacker- and conveyor belts, weight determination, etc. the blending operation is executed with the greatest care. Since summer 2013, OVET has a new state-of-the art train loading station available at its terminal in Vlissingen/Flushing. This new piece of equipment will allow OVET to receive 44 wagon trains in one length. A 24-hour round trip to, e.g. the German Ruhr area, has proven to be successful. The station has a maximum loading capacity of 1,500tph (tonnes per hour) and is equipped with an automatic weighing system. OVET already runs trains on a daily basis and the load factor has proven to be 100%. With the new installation OVET is able to load the weight up to kilogram accuracy. The train-loading facility has a glycol installation and a de-ironing magnet. Germany makes very great use of coal from overseas at its power stations, and large quantities of this fuel are imported through the seaports on the North Sea coast. Dry Cargo International spoke to Michael Appelhans from the Rhenus Group about what port operators need when handling coal and the opportunities that are available at a time when Germany is about to abandon nuclear fuel and make even greater use of renewable sources. Everybody is talking about energy from the sun, wind and other renewable sources, and the aim is to guarantee clean power generation in future. So is the modernization and expansion of the Rhenus Bulk Terminal in Wilhelmshaven not rather out of tune with the times? Michael Appelhans: The decision to expand and modify the facility was made in 2008 and the general conditions at that time were certainly different. There’s no doubt about that. But in order to anticipate your question about whether we would make the same decision now, I’d point out that it’s part of logistics experts’ daily work to familiarize themselves with new conditions and adapt their services to customers’ changing needs. So you would make the same decision again? Michael Appelhans: Certainly not in quite the same way, because that would indicate that we’d not learned anything from the changing circumstances as Germany moves towards greater use of renewable energy sources. But with the two local power stations and our circle of customers further inland, we have a good foundation for the ongoing development of our business. Imported coal will still be needed to guarantee supplies in the energy mix in Germany and our terminal is ideally equipped to cope with this task. Greater quantities and new supply chains can and will make their way through Wilhelmshaven. Which specific measures have you adopted as a result? Michael Appelhans: We’ve invested in new cranes, which enable us to unload vessels quickly, and more efficient conveyor belt systems. We’ve expanded our storage capacity and fine-tuned our loading operations for railway wagons. Our fully automatic stacker/reclaimers and the efficient wagon loading facility guarantee high handling rates and rapid dispatch operations for the trains connecting Wilhelmshaven with the power plants located further inland. And you were able to handle the first fully laden Capesize vessel at a German seaport at the end of 2012? Michael Appelhans: That’s correct. By deepening the navigable channel to 18.50 metres, Capesize vessels can now reach the Rhenus Bulk Terminal Wilhelmshaven without having to unload part of their cargo elsewhere first. We’re now a genuine alternative to the ARA ports and are better equipped than other German North Sea ports. Customers using our services can be certain that we will provide professional handling for their maritime and rail traffic at any time. Have these improvements been reflected in your turnover figures too? Michael Appelhans: It was quite natural that certain types of business had to be handled in a different way for a brief period during the modification and expansion work in Wilhelmshaven. We offered our customers handling services at our Nordenham business site, for example, during this phase. Since the completion of the work in Wilhelmshaven last year, the optimization of the terminal facilities has had a very positive effect on our turnover. Handling 3.3 million tonnes of coal is a new record for the Rhenus Bulk Terminal Wilhelmshaven. And we have firm plans for further growth, because the conditions here allow us to achieve even more. But to reach our target of between eight and ten million tonnes, we’ll naturally have to continue investing in handling and storage facilities in line with our customers’ wishes. What’s the next project in the pipeline? Michael Appelhans: Up to now we’ve had two storage areas for 900,000 tonnes of coal. They’ll no longer be enough in the light of the growth that we’re expecting. We’re busy planning a third storage area, which will further increase the space available once it has been completed. HAROPA, the joint venture between the ports of Le Havre, Rouen and Paris (France), is a new port system joining forces to provide end-to-end competitive solutions, thus constituting the fifth-largest North European port complex. HAROPA provides 55 sea and river terminals, dedicated to the handling of dry and liquid bulk from the sea to the east of the Paris area. Dry bulk accounts for a significant part of the overall traffic of HAROPA ports, in addition to container traffic for which HAROPA ranks number one in France. Dry bulk especially includes grain (wheat, barley, etc. ), coal, sugar, malt, cocoa, oil seeds, fertilizers, sand, gravels and crushed stones, aggregates, snow-clearing salt, peat, cakes, biomass, and more. HAROPA recorded 14mt (million tonnes) of dry bulk traffic in 2013 (+24 %). HAROPA recorded traffic of over 2mt in 2013, that is a 26% rise over the previous year. HAROPA-Port of Le Havre experienced a clear upturn and the imports of industrial coal also increased in HAROPA-Port of Rouen where five Capesize vessels were received by SEA-Invest. There were also double calls by Panamax vessels, which generates a maritime-river traffic (of around 100,000 tonnes) bound for the Paris area to provide city heating. There is also traffic growth for petroleum coke via Honfleur and Rouen, reaching 70,000 tonnes in 2013.
and Western Africa, being on the rise. It is worth noting that Le Havre port has strongly risen as regards the export of cereals (especially barley and malt to Asia and Africa) in containers. In 2013, there was strengthening in the cereal trade, especially by the creation by ‘Interface Céréales’ and ‘Axéréal’, of ‘Granit Céréales’ an association for grain marketing via HAROPA-Port of Rouen, which will come on stream in the coming months. With 1.9mt of aggregates, HAROPA records stable traffic. High growth also recorded at the terminals of HAROPA-Port of Rouen (756,000 tonnes of aggregates, +22.3%) especially due to the business of the SPS company in the Rouen area which started in July 2012, the contract of construction of the A 150 motorway developing traffic from Norway via Stema in Rouen and the business of Holcim Yeoman/Eurovia in Saint-Wandrille, also in Rouen area. New prospects are being made concrete by the concessions of marine aggregates along the English Channel sea coast, developing volumes extracted of more than 15mt per year for 25 to 30 years. GPN being bought out by the Boréalis Group very positively strengthens the industrial site of Rouen/Grand-Quevilly and develops the export of ammonium nitrates. The logistics of imports of dry fertilizers via Rouen is part of Cap Invest business, being created between Cap Seine, SEA-Invest and In Vivo. In imports, too, the American company Koch, is growing in partnership with Sénalia, and the other operators are showing dynamism in inbound ammonium nitrates and compound fertilizers. It has been a year of recovery for HAROPA-Port of Rouen terminals, as regional authorities and motorway management companies have built up their stocks again. HAROPA, the fifth-largest port complex in Northern Europe, is a joint venture between the ports of Le Havre, Rouen and Paris. Connected to every continent owing to a first-rate international shipping offer (with connections to more than 550 ports worldwide), the ‘one-stop’ hub forms a global transport and logistics system, capable of providing a comprehensive end-to- end service. It handles around 120mt of cargo by sea and waterway each year. HAROPA business represents 160,000 jobs. The new facility will be operational from 1 February 2014, it will be staffed with Inspectorate employees and equipped with two QHS Hammermill crushers, a Retch SR300 Rotormill, drying ovens, and Gilson riffle dividers. From the initial bulk sample of several tonnes, the facility can rapidly produce representative laboratory samples of <0.2mm to test the coal quality for its customers. Erwin Oosterveen, Inspectorate’s Solid Fuels Business Development Manager for the UK and Northern Europe, said: “This major new development in on-site sampling should be tremendously helpful to the industry. It’s a one-stop shop for the energy industry that is convenient and quick. And that’s all backed up by the accuracy of testing and analysis for which Inspectorate International is renowned. On 20 September 2013 completion of the new sheet pile wall at the Elbe Port of Brunsbuttel for around €10 million was marked by a small ceremony attended by Dr. Frank Nagele, Parliamentary Under-Secretary in Schleswig-Holstein’s Ministry of Economics. Inaugurated in 1968 and owned by the private SCHRAMM group, the Elbe Port of Brunsbuttel has been upgraded in a further stage of development. At least ten years ago, a section of the port on the Eastern bank of the Elbe was reinforced with new piles. Now the middle berth in the Elbe port, a universal one handling bulk and, especially, general cargoes such as wind power installations, has been prepared for the coming decades and equipped to meet future requirements. A new sheet pile wall to handle greater loads has been positioned and driven as part of the building work. The hydraulic building work has been carried out by Tiefbau Unterweser GmbH, or TAGU. “With this private investment, the Elbe port is being even better equipped for handling such general cargoes as plant and project shipments or wind power installations for the onshore and offshore sector. At the same time, the top priority principle in our corporate approach will remain flexible reaction as a universal port to the requirements of the market,” explains Frank Schnabel, Managing Director of Brunsbuttel Ports GmbH. Brunsbuttel Ports GmbH, the private port operator and owner of the infrastructure, is investing a total of approximately €15 million in upgrading the middle berth. As the main element of the project, the new sheet piling wall has now been completed, involving total investment of around €10 million. The state of Schleswig-Holstein is backing the project with around €1.35 million from its ‘Future of the Economy Program’. This investment in an infrastructure measure further strengthens Brunsbuttel as an industrial base. Having reported steady growth in recent years, Brunsbuttel Ports are well positioned for the future. “Completion of the sheet piling wall represents a further step in consolidating and maintaining the Elbe port’s successful growth course,” said Dr. Frank Nagele, Parliamentary Under- Secretary for Transport, as it entered service. “I feel confident that Brunsbuttel’s further development will proceed satisfactorily. The present state government will play its part in that,” continued the Under- Secretary. Following the ramming work, parts of the pier surface in the port area are being renewed; in addition, maintenance work is being done on the quayside rail track and the crane rails. Completion of the building work as a whole is anticipated in autumn 2014. Even though the figure of almost 30.3mt (million tonnes) of commodities handled last year in Poland’s Port of Gdansk cannot equal the performance of the largest ports of Asia, Africa, North America or Western Europe, it makes Gdansk one of the very leading ports in the Baltic Region, writes Janusz Kasprowicz, PR Officer, Port of Gdansk Authority SA. A thousand-year-old port erected at the mouth of the Vistula River, the queen of Polish rivers, reminded the world of its chief assets. Since it is situated at the intersection of main trading routes connecting Eastern and Central Europe with Scandinavia, and the west with the east of Europe, the Port of Gdansk has been an important trading centre for centuries. Poland’s accession to the European Union created additional opportunities for Gdansk to develop, including the use of the EU funds. The already completed and scheduled projects will result in the extension and upgrade of the port’s infrastructure to let it keep up with global trends. They also make the Port of Gdansk, the never-freezing easternmost port on the Baltic Sea, available 12 months a year for almost 165 million commodity recipients and providers from landlocked countries, including the Czech Republic, Slovakia, Hungary and Belarus. It is a traditional partner for producers and consumers from north-eastern Ukraine. The Port of Gdansk handles cargoes of crude oil for refineries in Poland and Germany as well as a stream of container cargoes to Russia. With a throughput of over 1.15 million TEU, the Deepwater Container Terminal owned by Global Infrastructure Fund, a fund managed by Macquarie Bank Group seated in Australia, placed Gdansk in the Top 100 of largest container ports in the world. The Port of Gdansk was designated an important node in the EU transport corridors. The value of commodities handled in 2013 exceeded €40 bn. A sizeable portion of all commodities handled in Gdansk included liquid fuels pumped from and to the port through pipelines. The second place was taken by containers. In receiving deep sea vessels with maximum draught for transiting the Danish Straits, Gdansk serves a role of a Baltic hub port for both types of cargoes. Because of its investment attractiveness and co-operation with global shipping powers, including SEA-invest, the owner of Port Pólnocny, the Port of Gdansk regained the significance it had during the Hanseatic League in the Middle Ages. Safe sailing in the deep-water, up to 15 metres in draught, and never-freezing section of the port is supported by extensive development base located on both banks of the Vistula — the river that as early as over one thousand years ago made it possible for commodities to float from the broad overflow area connecting Central European countries through navigable canals. Quays that still make a considerable contribution to the port’s throughput were built along the river banks. Vessels of up to 10.5 metres in draught handled by Port Gdanski Eksploatacja company berth to that quays nowadays. Having handled over 4.5 million tonnes of commodities in 2013, PGE had a 15 per cent share in the port’s total operations. Its significance for the port and, more importantly, profitability are determined by types of cargoes that are attractive for short-range sailing. Port of Gdansk Authority S.A. is going to find, in line with the Polish law, an investor for the company that would be interested in buying 100 per cent of the company’s shares in order to enable PGE to fulfil the rising number of tasks provided for in the port’s development strategy. The new budget of the European Union passed under the 2014–2020 Financial Framework provides for a considerable portion of funds for the development of sea transport and improvement of port availability. A substantial portion of projects prepared by PGA S.A. stipulates the increasing of the port’s internal part’s throughput. As a result, new opportunities will be created for handling companies. A reasonable and real scenario for the port’s development, based on the World Bank’s forecasts and key factors of economic growth in the EU member states, anticipates that the number of handling operations carried out in the port will be multiplied. The port faces new prospects as it started receiving, as part of AE container service, Maersk Line world’s largest Triple-E class container ships holding 18,200 TEU at a time. The Port of Gdansk’s promotional slogan reading ‘a port for any ship and any cargo’ has come true. For 2013, the world economy was expected to grow by 2–2.2% for a fourth consecutive year after the negative results of 2009, although this growth will be lower than that of 2010, 2011 and maybe 2012, writes Dr George Vaggelas, Advisor to the President and C.E.O. of Thessaloniki Port Authority S.A.
Based on the forecasts of UNCTAD (published in the Review of Maritime Transport) the seaborne trade for 2013 will reach 9,568 billion tonnes, an increase of 4.39% comparing with the 2012 seaborne trade volume. The five major dry bulk cargoes are expected to represent a significant part of this traffic. In 2012 for example the seaborne trade of the five major dry bulk cargoes reached 2.7 billion tonnes. Coal continues to play a significant role, not only among the five major dry bulks, but also in the global seaborne trade as 1.06 billion tonnes of coal transported by sea in 2012. The top three exporters of coal for 2012 (Indonesia,Australia and U.S.A, in a hierarchy ranking) represent 73% of the global coal exports while the top three importers (EU, Japan and China in a hierarchy ranking) represent 52% of the global imports. For 2012, the European Union imported 222.61mt (million tonnes) of coal, while it’s worth mentioning that almost 30% of the power generated in EU is coal based. Coal is also an important commodity for the Southern Balkan countries due to the fact that many steel industries (a major consumer of coal) are located in that area. As a result coal trade is an important component of the region’s port traffic. There are three major ports that facilitate the coal trade in this area,Thessaloniki in Greece, Durres in Albania and Bar in Montenegro. Thessaloniki is the biggest among the three ports and due to its proximity to major sea routes as well as the road and rail connections with its hinterland is the first choice for the shippers. Thessaloniki is the second biggest port in Greece and the first in handling dry bulk cargoes. It has six piers, with four of them used for handling cargoes. The dry bulk and general cargoes are facilitated through piers 4, 5 and the eastern part of pier 6. There are two specialized docks for handling coal, dock 21 with a length of 185m and a depth of 12m and dock 24 with a length of 635m and a depth of 12m. If needed, dock 20 with a length of 350m and a depth of 10m can also be used for handling coal. Dock 21 is equipped with a rail-mounted dock crane with a capacity of 15 tonnes and two mobile harbor cranes with a capacity of 100 tonnes. Dock 24 has six rail-mounted dock cranes, four of them having a capacity of 40 tonnes and the other two having a capacity of 32 tonnes. For the storage of coal there are open space areas with a total surface of 3.5ha at piers 5 and 6. These areas are included at the port’s Free Zone which complies with the EU customs regulation. The Port of Thessaloniki handles any kind of dry bulk cargoes. 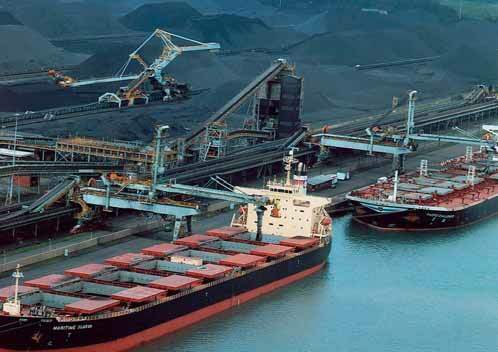 For 2013 the port handled 3.78mt of dry bulk cargoes, of which 349,000 tonnes were coal. Based on the above data, coal represents 9.22% of the total dry bulk traffic at the port of Thessaloniki in 2013, showing a significant decrease comparing to the previous years. The most important outcome is that almost half of the coal traffic is destined to the port’s hinterland (as the whole transit traffic represents imports by the neighbouring countries) although in 2013 the transit volumes followed the general decreasing trend. The decrease in coal throughput for 2013 can be attributed to the reduction of the steel factories production in FYROM (Former Yugoslavian Republic of Macedonia), a fact that is also evident from the transit volumes which fell by almost 53%! The Port of Thessaloniki is well connected with its hinterland through road and rail network. The completion of Trans- European Transport Corridors IV and X will expand the port’s hinterland and will give access to the central European markets. From March 2014, the quality of the port’s hinterland connections will be increased because of two regular rail services that will be launched. More specifically there will be two weekly itineraries from Thessaloniki to Skopje (FYROM) and vice versa for the transportation of dry bulk cargoes as well as two weekly itineraries from Thessaloniki to Sofia (Bulgaria) and vice versa for the transportation of containers. The itineraries will be evaluated after four months and if needed, the capacity will be further increased with additional itineraries. Also during 2014 new rail connections will be tested. Thessaloniki will be connected with Istanbul, Belgrade and Bucharest. If these itineraries prove to be successful, additional itineraries are likely to debut in the future. Thessaloniki port authority planned an expansion of dock 24 by 300m in length and 160m in width creating a new dock with a depth of 16m able to facilitate bulk carriers up to 80,000dwt. This major investment has been put on hold by the main shareholder of the port authority, the Hellenic Republic Asset Development Fund (HRADF). The reason behind this decision is the long-lasting (since 2011) process of HRADF on deciding the further exploitation of the port with the use of private funds. HRADF until now has not taken a clear position on this issue although there are signs that HRADF will proceed with the privatization of the Thessaloniki port authority by selling its shares (about 74.27% of the port authority’s shares). Despite the stagnation on the port infrastructure projects, investments in new cargo handling equipment are under way. Recently the port authority ordered a rail-mounted dock crane of 40 tonnes capacity. The cost of the crane is €3,47 million and is expected to be operational at the end of 2014.Also the port authority is in the process of ordering two additional rail-mounted cranes with 40 tonnes capacity each. Dr George Vaggelas is an Advisor to the President and C.E.O. of Thessaloniki Port Authority S.A. and a Research Fellow in European Port Policy (EPP) at the University of the Aegean, Greece. He has authored several papers published in scientific journals and conferences. He is member of PortEconomics.eu, a web-based initiative aiming to advance knowledge on seaport studies. The Port of Pori has two harbours. In Tahkoluoto harbour, coal is the main commodity. In the year 2013, coal handling volumes recovered. One million tonnes of coal were imported to the Port of Pori. The amount of coal import increased by 64% compared to the previous year. About 0.3mt of industrial coal was reloaded to barges and transported to the smelter north of Pori, where the winter navigation conditions are more difficult than in Pori. The total volume of coal handled was thus 1.3mt. The total volume was, however, far away from the long-term average of nearly 2mt. The stockpiles were already full in the season 2012/2013 and, during winter 2013, capacity use of the coal power plants situated in the port area was at low level. Therefore no Capesize vessel called at the Tahkoluoto harbour in 2013. The year was exceptional, because normally three to five Capesize vessels over 100,000 tonnes call at Tahkoluoto annually. The year was also exceptional due to the call of Nordic Orion. Nordic Orion, owned by the shipping company Nordic Bulk Carriers, sailed through the Northwest Passage on its way to Pori. The vessel carried coal from Canada to Finland. In this historical voyage Nordic Orion was the second cargo vessel and the first dry bulk carrier ever to use the Northwest Passage as a shortcut from ocean to ocean. (See ‘Historic sea route opens through Canadian Arctic harbours’ on p21 of the October 2013 issue of Dry Cargo International.) The vessel called at Tahkoluoto harbour at the beginning of October and, one month later, her sister vessel Nordic Odyssey called at Tahkoluoto using the same route. Besides coal,Tahkoluoto also handles recycled metals, minerals, ferrous sulphates and ammonium sulphate are handled. In 2013 soya beans were handled in Tahkoluoto harbour for the first time. Soya beans were imported from South America on a large vessel and unloaded to shore. One part of the cargo was reloaded directly from-ship-to-ship. A smaller vessel transported soya beans to a port south of Pori, where dimensions of the fairway does not allow large vessels. Ship-to- ship handling is rarely done in the Port of Pori, but the work was done fluently with the bridge crane made by Konecranes, which has an outreach of 45 metres. In Mäntyluoto harbour the main dry bulk commodities handled are copper and nickel concentrates. In concentrates the flows are steady, because of the nature of the smelting industry. Concentrate comes from abroad, but concentrate shipment with a coaster from the mining area in Northern Finland was also tested during the year 2013. Growth is predicted for the mining industry in Finland, with the boom speculated to be waiting just round the corner. As a general port handling all kind of cargoes, the Port of Pori is ready to serve the metal and mining cluster as a whole, not only in dry bulk, but also in chemical transports and in project cargoes. The Port of Pori is benchmarking itself as one of the best ports for the mining industry in Finland. There is plenty of vacant land for example for a pelletizing plant of ores. Besides concentrates, other dry bulk commodities are also handled in Mäntyluoto, for example recycled metals, salt and grain. The Port of Pori’s dry bulk handling infrastructure is in good shape. Much attention has been paid to the environmentally friendly handling of dry bulk. In Tahkoluoto, there is a closed loading system for dust created by dry bulk. Also other conveyors are covered. New large investments on dry bulk infrastructure were not made in 2013. ISO 9001, ISO 14001 and OHAS 18001 certificates issued by DNV were kept in force. The Port of Pori has the deepest fairway in the Gulf of Bothnia, which is the sea area between Finland and Sweden. The depth of the fairway to Tahkoluoto deep harbour is 15.3m and to Mäntyluoto harbour 12.0m. All vessels that pass the Danish Straits are able to call at Tahkoluoto when draught is considered. Energy efficiency is one of the means that the Port of Pori will use to tackle the upcoming sulphur emission restrictions in 2015. New fuels will also be on focus. In Tahkoluoto harbour there is a site and an approved town plan for a LNG terminal. The investment decision will be made probably during the year 2014. The LNG terminal will serve bunkering of the vessels, but it will also improve operating conditions of the industry situated in the hinterland of the Port of Pori. Supply of LNG enables investments like pelletizing plant for different kind of ores. Dry bulk throughput in the Port of Rotterdam increased with 14% to 89mt (million tonnes) last year — the best result since 2009, the year that dry bulk traffic collapsed with 30%. The good result in 2013 was for a large part due to the strong increase in coal. In fact, with almost 31mt, coal throughput reached an all-time high in the history of the port. The main reason for the strong growth in steam coal handling was the favourable situation in the European energy market: there was a large supply of cheap coal from the USA (where coal was squeezed out the domestic market by shale gas), and at the same time the price of gas was relatively high in Europe, combine this with very low CO2 prices and it is clear why utilities were burning a lot of coal- and gas-fired power plants were mothballed. Another reason was the continuing decrease of German coal mining. In the first nine months of 2013 German coal production declined by 32% to 6.2mt. The last mine will close in 2018. In contrast coking coal imports developed less positive. The demand for steel making raw materials (coal, iron ore, scrap, minerals) by the European steel industry remains depressed. This makes it all the more remarkable that iron ore throughput in Rotterdam increased with almost 10% last year. This is because the port was able to benefit from its unrivalled nautical advantages, Rotterdam is the only port in North West Europe where Valemax vessels (400,000dwt) can enter. These ships were originally intended for the Brazil–China trade. However, because the Chinese government refuses to let these ships enter Chinese ports, mining company Vale seeks other employment for these giant bulk carriers in other markets like the Middle East and Europe. In 2013 seven Valemax bulk carriers called at the Port of Rotterdam, from where the iron ore was distributed to blast furnaces in Dunkirk, Bremen, Ghent and Dillingen. competition can be expected from the port of Wilhelmshaven in Germany. This port has increased its coal handling capacity to 6mt, not only to accommodate the local power plants but also looking at rail distribution of coal to power plants in the hinterland. And, in the longer run, one of the consequences of the Dutch Energy Agreement is the closure of older coal-fired power plants in the Netherlands. Three plants will be closed by January 2016 and the other two by July 2017. Although the decision is under condition of approval by regulator ACM (the Netherlands Authority for Consumers and Markets). An alternative fuel for coal-fired power plants is biomass. In 2012, the Port of Rotterdam (including Dordrecht) handled around a million tonnes of biomass, more specific wood pellets. And several stevedoring companies in the port (ZHD, EBS) already have increased their covered storage capacity. But demand for wood pellets fell last year. One of the reasons is the temporary closure of the GdF Suez coal plant in Nijmegen because of a fire. However, more importantly, the subsidy scheme for biomass co-firing has ended. This is another clear indication of the uncertainties in this market, without some form of government support it is very difficult for biomass to compete with coal. The low CO2 prices also are not really helpful in this respect. For 2014 the port is more positive about the prospects for the heat market. Strong growth in demand for premium pellets in countries like Germany, Austria and Italy opens up the market for more overseas imports. In addition to the gradual transition to sustainable energy production, the Port Authority also works on the development of a CO2-Hub. In order to neutralize CO2 emissions from coal plants and other large industrial installations, a lot of work is going into the capture and storage of greenhouse gases. In connection with this, E.ON and GDF Suez are working together in ROAD (Rotterdam capture and storage demonstration project). The aim of this project is to capture 1mt of CO2 and store it in a large empty gas field under the North Sea, for several years starting in 2017. This is the next step for a CO2 hub development at Rotterdam. The Port Authority is collaborating with several stakeholders to construct CO2 pipeline infrastructure, which various companies will be able to use to transport CO2 to offshore reservoirs and to greenhouses. The future infrastructure will also provide opportunities for coal-fired power plants in the hinterland to transport their CO2 to the hub in Rotterdam. Within a sustainable energy port, both coal and biomass will play a significant role for the port of Rotterdam in the coming decades. Along with the economic recovery in Europe, industrial production will pick up again, and this implies that demand for raw materials and solid fuels will show positive growth in the coming years. Therefore the port is confident that the good dry bulk throughput result of 2013 can be sustained in 2014 and beyond. Terminales Portuarias del Pacífico (TPP) has purchased a second crane to support its operation, selecting a LIEBHERR Pactronic LHM 600 model, which will be operational by March this year, expecting to increase its loading rates to 40,000 tonnes per day. TPP is the first specialized port terminal in bulk cargo and steel products handling, principally, iron ore mineral, and energy products. In 2013,TPP handled an annual tonnage of 3.6 million metric tonnes. St. James Stevedoring Partners LLC announced the dedication of two new Model 8 Terex/Gottwald floating cranes on 28 February 2014. The new cranes are named the Miss Tara and the Randy W after long-term St. James employees Tara Sevario and Randy Wintz. The addition of these two cranes bring St. James’ fleet of TEREX/Gottwald floating cranes to a total of 10 cranes, the world’s largest TEREX/Gottwald floating crane fleet. The new Model 8s feature Verstegen buckets, the first Verstegen buckets used in the United States. Each crane is fitted with a 61 yard rubber sealed general purpose buckets, a 54 yard rubber sealed intermediate product bucket and a 25 yard heavy ore bucket. The cranes have a gross lift of 63mt (metric tonnes) at 149 feet radius. St. James was founded in 1985 as a Mississippi River midstream stevedore with stevedoring operations between New Orleans at Baton Rouge. St. James has six berths and an annual capacity exceeding 30mt of dry bulk. St. James specializes in transfer of dry bulk materials such as coal, fertilizer, ores and minerals, cement and grain by-products between ship and barge. St. James also handles steel, bagged cargo and project cargo transfers between ships and barges. St. James also provides stevedoring services at industrial facilities. Operational excellence and customer service continue to be the company’s guiding principle. In 2013 the company achieved regular loadings of coal at rates over 60,000 tonnes per day. In addition to handling panamax sized vessels St. James regularly loaded Capesize vessels. Safety remains a high priority at St. James. Since 2006 St. James has given away eight pick-up trucks valued at a total of $240,000 to employees for meeting safety goals of no lost time injuries. Innovation has been a hallmark of St. James. In 2003, the company began a system of statistical measurement of process. This system has led to major changes in management direction as well as driven the development of new technologies. St. James was the first company in the world to place mobile harbour cranes on barges. In 2013, St. James, in conjunction with Phoenix Products, pioneered the use of LED lighting on floating cranes. The use of LED lights at St. James has proven to save fuel as well as improve St. James productivity. In addition St. James now has a safer working environment due to the ‘instant on’ feature of its LED lights. All of St. James cranes are now fitted with LED lights. St. James sister company, St. James Technologies, was created to develop innovative solutions for the stevedoring industry. The basic idea was to use St. James Stevedoring as a laboratory in which operator driven technological solutions could be developed. One of St. James Technologies successes is Harbor Telematics a company created to develop a crane data system (CDS) for TEREX/Gottwald cranes. By the end of 2013 more than 50 cranes worldwide were fitted with the Harbor Telematics CDS system. The Harbor Telematics system allows the crane owner/operator to monitor crane conditions and performance on a real time basis. It also features an alert system, with which email notifications are sent of designated operational and maintenance conditions. An example of the benefits of St. James’ Harbor Telematics CDS is the St. James fuel savings system — when a St. James crane is idle for 15 minutes the Harbor Telematics CDS sends an email to the St. James on duty operations supervisor who then makes an affirmative decision to continue operations or switch to auxiliary power. In St. James operations, the company anticipates significant annual fuel savings and a smaller operational carbon footprint. In February of 2014, St. James will be dedicating and moving into its new office building. The new St. James office is the 49,000 square foot, former Romeville Elementary School which was purchased by St. James from the St. James Parish School Board in late 2012. The complex includes a full gymnasium and 13 acres of land for future development. The new office features an array of innovative technologies designed to improve communications and transparency of operations. The new office building will also be the headquarters of the St. James led Next25 Foundation. The Next25 Foundation received its’ non-profit status from the US Government in 2013. The goals of the foundation are to facilitate the training of local residence for jobs in local industry. The foundation is led by an advisory board made up of senior managers of industry, community leaders and government officials in St. James Parish, Louisiana. Through the Big River Coalition, St. James continues to work toward the deepening of the Mississippi River to 50 feet to match the new Panama Canal.Today Mississippi River is the only port on the US Gulf which will be able to immediately offer loading of vessels to 47 feet on the first day the New Panama Canal is opened. The long-term demand for thermal coal’s use as the baseline energy source by many developed and developing countries looks strong, and although steel production has slumped in the short term, the longer-term outlook for steel production, and the resulting demand for metallurgical coal looks bright, as well. This international demand will provide many US coal companies a target market beyond the normal domestic thermal power consumption that has been reduced substantially by the new large supply of natural gas in the US. Kinder Morgan has been working closely with many large US coal companies over the past few years to make significant improvements to provide new export terminal capacity at its terminals due to this new, long term market shift. In 2014, many of the improvements that Kinder Morgan has been making to terminals, such as Pier IX in Newport News,Virginia, IMT in Myrtle Grove, Louisiana, and Houston Bulk Terminal and Deepwater Terminal in Houston will finally come online, giving these customers long term terminal access that represents roughly 25.2 million new tonnes of new coal export capacity. In April of this year, Pier IX Terminal in Newport News Virginia will add 1.5mt (million tonnes) of new capacity with an expansion of the terminal’s coal storage yard. This expansion is targeted for handling mostly new metallurgical coals going to Europe and the Far East. The expansion will also include the dredging of the north side of the export berth to 50 feet for acceptance of larger coal vessels to parallel this same draft allowance already on the south side of the berth. The additional coal storage capacity is fully subscribed and is supported by a new long-term agreement with a major US coal producer. Upon completion of the expansion, the improvements will increase the total coal export capacity of the Pier IX Terminal to handle more than 16 million short tons of coal per year to the export market. include a new ship loader that is capable of loading cape-size vessels. The improvements also include a second continuous barge unloader, improved reclaim and distribution systems, and a dedicated barge loader for ocean going Gulf barges. These improvements have been made to eliminate technical bottlenecks that have constrained the terminal’s throughput capacity in the past. Upon completion of the improvements, IMT will have an export capacity of 16 million short tons. Kinder Morgan’s two Houston,Texas terminals, Houston Bulk Terminal and Deepwater Export Terminal, provide export coal throughput for western producers that wish to rail their coal directly to the US Gulf, as compared to railing coal to the Mississippi River and barging it to the secondary export terminals located in the lower river region of the US Gulf. Back-stopped by long-term contracts with large coal producers, Kinder Morgan is constructing improvements at its existing petcoke export terminals that will allow them to efficiently and economically export western coal. At the Houston Bulk Terminal, Kinder Morgan has constructed a new coal receiving, storage and reclaim system. The receiving system consists of a shaker house with a rail dump pit with 72 inch conveyor belts. The coal is then put on a storage pad using a 180 degree stacking system. Houston Bulk Terminal also has seven storage tracks capable of storing up to 300 railcars at a time at the terminal. Kinder Morgan has also upgraded the existing shipping system, which will increase the terminal’s coal and petcoke export capacity.The terminal also has a brand new dockside shipping conveyor that increases the maximum vessel loading rates at Houston Bulk Terminal to 3,000tph (tonnes per hour). The Houston Bulk Terminal has the capability to export 3 million short tons of coal annually. Just down the Houston Ship Channel from the Houston Bulk Terminal, Kinder Morgan is finalizing improvements to its Deepwater Export Terminal that include a new shiploader capable of loading post-Panamax vessels at rates approaching 5,000tph, new rail loop tracks capable of simultaneously holding three, 135-car unit trains, a new railcar rotary dumper, and segregated distribution and dual reclaim systems on each pad capable of rates of 2,500tph each. Following completion of the improvements in mid-2014, the Deepwater Terminal will have an export coal throughput capacity of 10 million short tons of coal per year. In addition to the East Coast and Gulf expansions, Kinder Morgan continues to investigate the development of additional export terminal capacity in the Pacific Northwest and other markets for US coal producers, trading companies and foreign utilities. All of the capital improvements will be designed and constructed to meet or exceed industry safety and environmental standards for similar facilities. Safety, environmental excellence and compliance, and commitment to our customers continue to be high priorities at Kinder Morgan. In 2013, Kinder Morgan Terminals recorded a Total Recordable Incident Rate (TRIR) of 1.64 which is considerably less than the industry average. BHP Billiton has refused all government requests to give up capacity at Richards Bay Coal Terminal to junior black miners. It said that accusations made by Transnet CEO Brian Molefe that it was hampering access to the facility were “far from the truth”. Indeed, the company says that the problem it faces at Richards Bay in using its available capacity is down to the failure of Transnet to develop the rail link in line with expansion of both the port and terminal. As a result, it says it is unable to develop new mining interests because of a lack of sufficient logistics support. At present, the coal terminal can handle approximately 91mt (million tonnes) of export coal per annum;Transnet can only offer a theoretical capacity of 79mt on the connecting railway line.